This entry was posted in Clothing, Home Improvement, inspiration, Organization, This and That, Tidying and tagged human behavior, inspiration, this and that, tidying by Becky Goldsmith. Bookmark the permalink. i have not read this one yet, just ordered the kindle sample! I want to do my clothing SO BAD… good for you!! This is just what I needed, and at just the right time! I have been feeling bogged down and knew I needed to get organized, but I see now that I need most of all to de-clutter and tidy, then the organization will be so much easier. Thanks! Thank you! Thank you! My husband and I have both decided we need to do a whole house de-clutter. This post came at the perfect time. We’ll be ordering the book. Wish us luck!!! Thank you, Becky, for the nudging and the photos to back up your words. This sounds do-able. This is do-able! Right before you start, it can look intimidating but just do it and you’ll be surprised. Reading the book does help to provide the motivation to both start and stick to it. Yeah, I didn’t think I’d like it either. But it’s true that, if you keep an open mind, you can learn a new thing every day! Wow! I’m impressed! I never thought of folding clothes that way but it makes so much sense! I’ve done a lot of decluttering methods over the years. So, the idea that the method doesn’t ALLOW you to touch someone else’s stuff was good, but what was better was the whole “Spark joy” concept. The idea that he was SUPPOSED to KEEP the things that he loved and made him happy was such a revelation to him. He’s using the method on his stuff, too. How nice to hear of a male who has embraced this! I have read the book and I like her method. Yes, she is repetitive but it helps it sink in and a highlighter is good. I have my clothing done except for shoes and bags. I know there are a lot of shoes to be touched but I am having a hard time gathering them. That tells you something. Does it bring me joy? It’s an easy and effective question as you have something in your hands. Thank you! I will get this book. I just hope she doesn’t include fabric stash as clutter! She doesn’t include fabric but I am going to use it on my stash. I weed out my stash regularly and the next time I am going to reorganize it, using some sort of shoe-ish box and standing the fabric up, rather than keeping it in stacks. i have always kept my fabric end up, i’m going to try the clothing too. Reading the book now Becky, thanks for the push to buy it, I’d been thinking on it! Reading Essentialism too, have you read that one? Nope, but I’ll give it a look-see :-). I’m half way through this book and I see Ms. Kondo’s method as spiritually significant. Sparking joy puts us on the best individual path for each of us. It clears the decks for us to live the way we choose, traveling light instead of being burdened by stuff. Now, to finish reading and put it to work…So happy to hear that others love this. I hope you kept that fabulous white shirt that you wore in Tucson in January. We loved it! Oh yeah. I do love that one! Think my DIL would consider it criticism if I forwarded this to her? Bless her heart! She tries to organize, but gets overwhelmed by all the stuff. You know, if she tries and fails it may be that she would welcome this. You could buy it and read it and then pass it on saying how much you loved it. Tell her it was recommended to you, too. Marie Kondo’s book is on hold for me at the library. 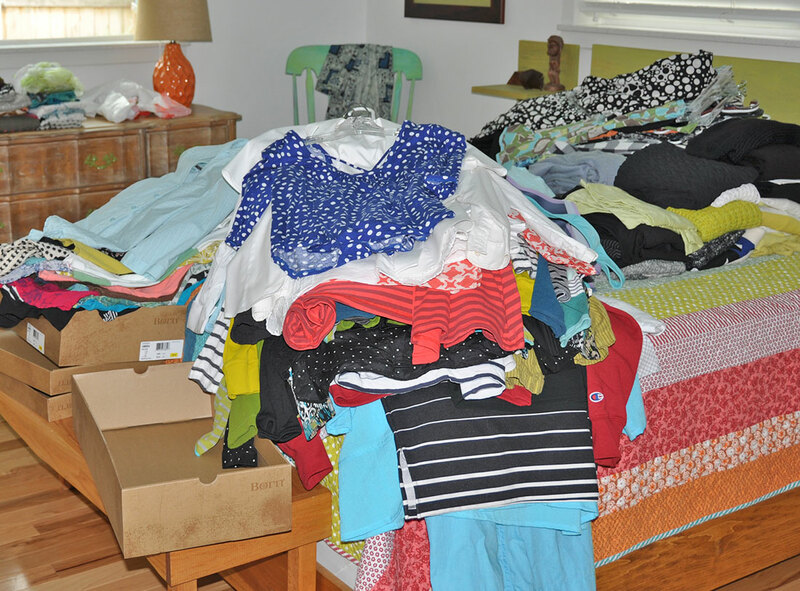 Per another organization blog, I have been storing my under garments and tee tops vertical already and I will never switch back. May I back another kindly suggestion. 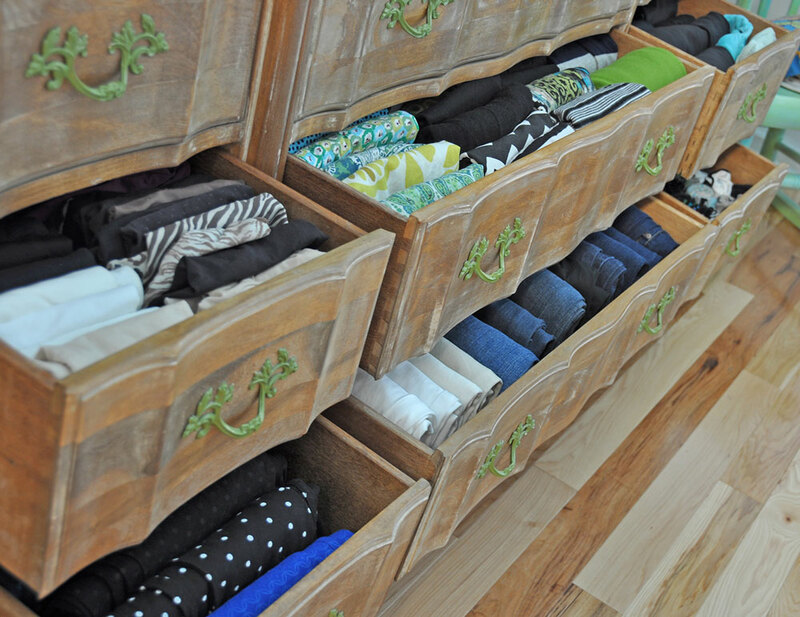 Use all the same matching hangers and everything will hang neat and tidy all lined up in a row. You know, I did that already just because it felt right and you are correct, everything fits in the closet better. Funny, my husband likes one kind of hanger and I like another. It’s actually easy to keep up with! So I went to Costco today, since I was a bit closer to it after going to the bank, & there was the book at Costco–I started to just read the part about how to fold your clothes & decided to just buy it. After returning home, I actually went through 2 drawers (thunder, so I couldn’t take the dog for a walk until that stopped). The contents of 2 drawers are now taking up 1 1/2 drawers & I can see my stuff! I think I’m going to like this! It’s kind of amazing, isn’t it! Thank you for the recommendation! I am reading the book now and hope to finally be able to throw out all the clothes I keep and NEVER wear!